The bohemian lifestyle has inspired generations of composers and songwriters, but few have attained the greatness of Giacomo Puccini’s beloved opera La Bohème. One of the Maestro’s mature operas, it shines with immaculate dramaturgy and holds audiences in a close embrace from beginning to end. As he presented the entertaining and tragic features of the Parisian bohème, Puccini crafted some of his most memorable melodies. At St Mark’s Anglican Church in Florence, you can enjoy these beautiful musical lines in an intimate arrangement for six singers and grand piano. Puccini composed La Bohème after a libretto by his faithful collaborators Luigi Illica and Giuseppe Giacosa. He worked with additional passion and drive because his rival Ruggero Leoncavallo was composing an opera based on the same source material. 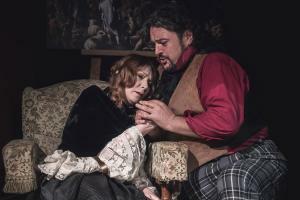 In the end, Puccini’s outstanding score and Giacosa and Illica’s sophisticated amalgam of witty dialogue and high drama made La Bohème an instant classic. Ever since its premiere on 1 February 1896 at Teatro Regio in Turin, it has graced the world’s stages with undying popularity and success. The plot follows the escapades of a group of lovable Parisian bohemians and centres on the love story between Rodolfo, a poet with a fiery temper, and Mimì, a charming but frail seamstress. As their feelings grow stronger and deeper, they must face life’s harsh realities and tackle poverty and sickness head-on. The motley crew of vibrant characters around them are rooting for them all the way, but the pair eventually has to make the hardest choice. To see if true love conquers all, head over to St Mark’s and witness this classic opera! The minimalist arrangement of La Bohème puts the spotlight on Puccini’s talent for melody and musical characterisation. From carefully constructed solo numbers like Mimì’s ‘Si, mi chiamano Mimì’ or Rodolfo’s ‘Che gelida manina’, you will get each character’s emotional depth and motivations thanks to the Maestro’s impeccable composition. Backed just by a grand piano, the melodies shine even brighter.